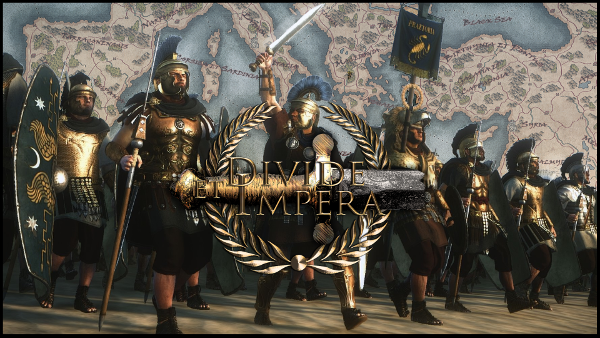 Divide et Impera is a total overhaul of Rome 2 that seeks to provide a challenging, historically authentic, realistic experience of the ancient world and warfare. As a team, we believe modding is an important part of Total War games that adds significantly to their immersion and longevity. Our focus is improving gameplay, adding core features and increasing challenge and realism by expanding Rome 2 with new concepts and creative systems that turn it into a different sort of experience. We believe modding should always be freely available to the players and our great community, this Patreon simply exists so that those who wish to support our work can do so in the form of donations. We were named CA's best Overhaul Mod 2014, CA's Most Innovative for 2015 and also won Player's Choice in both 2014 and 2015. Thanks to all of our players for your support! The best way to experience all of the changes in the mod is to jump right in. It is almost impossible to have a summary of everything in the mod that has been added over the past 4 years. Some highlights include a custom reforms system, custom population system, custom supply system, completely new battle AI and system, all custom rosters from the ground up (around 2000 units), custom building system, and a thousand other changes. See below for some links on manuals, guides and our forums for information. Beta-Test Feedback: Let us know directly about early test packs and betas! Submod Ideas: Suggest ideas for new submods! Special Ancillary - Suggest a custom household member in game! At this point the mod expenses will be covered and we can perhaps move on to expanding the community with our own website and informational resources. We can also spend more time developing new content and ideas.